Belfast dates back to the early 17th century and, although a relatively young settlement, is Northern Ireland’s largest, and the island of Ireland’s second largest, city. The name ‘Belfast’ comes from the Gaelic ‘Beal Feirste’ (‘mouth of the sandy ford’). 1641-49 & 1688-90 Two major Catholic risings are put down, first by English Protestant revolutionary Oliver Cromwell, then the Dutch King William lll of Orange. The fledgling Protestant plantation is secured and Ireland becomes firmly British. 18th Century Belfast becomes a major linen-producing centre, earning the tag Linenopolis. 19th Century Belfast experiences a ‘golden age’ under Queen Victoria. The Harland & Wolff shipyard is founded in 1862 and city status is granted in 1888. Belfast becomes one of the world’s leading industrial cities and most of its great buildings are constructed. The 1847 Famine re-awakens Irish Catholic Nationalism. Early 20th Century In May 1911 RMS Titanic is launched from Harland & Wolff. The following year the White Star liner sinks on its maiden voyage, killing over 1500 passengers. 1912 The Ulster Volunteer Force (UVF) is formed and Unionists sign the Ulster Covenant, pledging to militarily fight Home Rule. 1914-1918 The UVF, and most of the Irish Volunteers, joins up to fight for Britain - both hoping to gain support for their causes. In 1916 Ulster Divisions suffer heavy causalities at the Battle of the Somme. 1921 Following the 1919-21 Irish War of Independence, six of Ireland’s 32 counties remain British and the state - or Province - is named Northern Ireland. Belfast becomes its capital city and the Unionist-controlled government oversees direct rule from the purpose-built Stormont. 1941 Belfast Blitz. During WW2, the city is bombed three times by the German Luftwaffe, killing 955 people and destroying 3,200 homes. Northern Ireland becomes a staging post for over 300,000 American GIs. 1968 The Civil Rights movement grows as Nationalists protest Unionist bias at Stormont. The British Army is deployed in the streets of Belfast and Derry. 1971 August 9 Internment, or imprisonment without trial, is introduced. The city experiences a week of intense fighting as massive gun battles break out across North and West Belfast. December 4 15 people, including two children, are killed in a UVF bomb attack on McGurk’s bar in North Belfast. It is the first major atrocity of the ‘Troubles’. 1972 January 30 Bloody Sunday. During a Civil Rights march through the streets of Derry 14 unarmed civilians are shot dead by British troops. Both internment and Bloody Sunday ensure increased support for the IRA. Meanwhile, the British government introduces direct rule from London. 1972 July 21 Bloody Friday. Nine people die when, without warning, 21 IRA bombs explode across Belfast in just over an hour. 1981 Bobby Sands and nine other IRA and INLA prisoners die after going on Hunger Strike at the Maze Prison in protest at the removal of political prisoner status. 1985 November 15 The British and Irish governments sign the Anglo Irish Agreement, giving the Republic of Ireland a greater say in Northern Ireland affairs. 1988 Three IRA members are killed in March 6 by the SAS in Gibraltar. During their funerals loyalist Michael Stone launches a gun and grenade attack killing three mourners. At the funeral of one of Stone’s victims, two British Army corporals inadvertently drive into the cortege and are ambushed by an angry mob and shot dead by the IRA. Early 90s Violence continues on both sides as both the British and Irish governments attempt to break the political impasse. 1994 August 31 The IRA announces ‘a complete cessation of military operations’. The Combined Loyalist Military Command follows on 13 October. 1995 Security measures are relaxed and troop numbers reduced throughout Belfast and Northern Ireland. 1998 The Good Friday Agreement is voted in by 71% of the population. It marks a new power-sharing Assembly, early release of all paramilitary prisoners and looks toward withdrawal of British troops and decommissioning of paramilitary weapons. August 15 IRA dissidents plant a bomb in Omagh killing 29 people making it the single worst atrocity in the history of the Troubles. November 30 US President Clinton pays an historic visit to Northern Ireland. 2000 February 11 The Assembly is suspended following the breakdown of decommissioning talks. May 27 The UUP re-enters the power-sharing Assembly despite no IRA decommissioning. Devolved power is restored two days’ later. 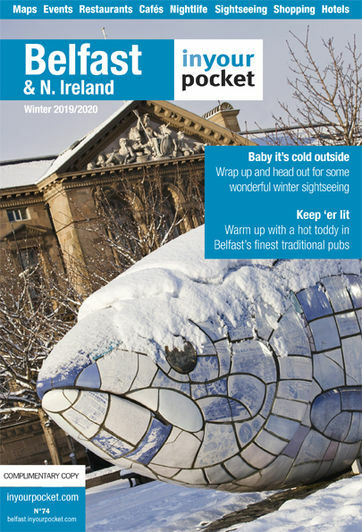 2000 December Belfast’s landmark Odyssey Millennium project opens, heralding major redevelopment of the historic Titanic Quarter. 2002 October 14 Devolution is suspended at midnight and direct rule returns to London. 2005 May 5 At the UK General Election the DUP and Sinn Fein strengthen their positions as NI’s two major political parties. July The IRA formally orders an end to its armed campaign. 2005 November 25 Belfast-born football legend George Best dies in a London hospital aged 59 after a long battle with alcoholism. The former Manchester United and Northern Ireland player was laid to rest in his native city on Saturday 3 December. 2007 March 26 Following local elections, and in an historic face-to-face meeting, DUP Leader Ian Paisley and Sinn Fein leader Gerry Adams announce the restoration of the NI Assembly on May 8. 2008 May Having founded the party in 1971, First Minister Ian Paisley steps down as leader of the DUP and, therefore, First Minister. He is succeeded by Peter Robinson. 2012 April Titanic Belfast visitor attraction opens on the centenary of the ship's sinking and on the site where it was built and launched. 2014 September 12 Unionist politician, former First Minister and firebrand church leader, Ian Paisley, dies aged 88. 2016 January DUP MLA Arlene Foster replaces Peter Robinson as First Minister. 2017 March 2 Following local elections, one seat separates the DUP and Sinn Fein as NI's top two parties. March 21 Former IRA Commander turned peacemaker and Deputy First Minister, Sinn Fein's Martin McGuinness dies after a short illness. DUP and SF hit a political impasse and the NI Assembly is still to sit.